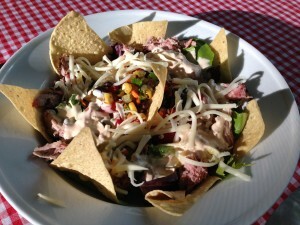 My Cowboy Smokehouse Salad with pulled smoked pork. Reminiscent of those long, hot, dusty days out West. Cowboys driving cattle from one place to another. Smoky fires each night while meat roasts on a spit. Beans simmering in a huge pot. And the clear night sky full of shining stars. 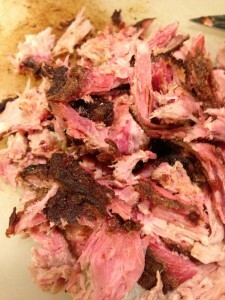 And by coincidence…well, sort of, my husband smoked a pork shoulder for our dinner on the Fourth of July. It’s a pretty big piece of meat and of course we had leftovers. I came up with this salad by using what I had on hand in my kitchen. There were no cattle in proximity and we chose not to cook beans…. We used a pan instead of a spit…. It was daylight…well, anyway…. 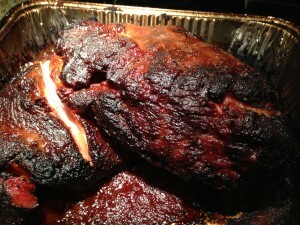 Here’s the view of the whole smoked pork shoulder from Fourth of July’s dinner. First, I cut a large piece of smoked pork from the leftover smoked pork shoulder. Using two forks, I “pulled” the meat into pieces. See how pink it is from the smoking process! 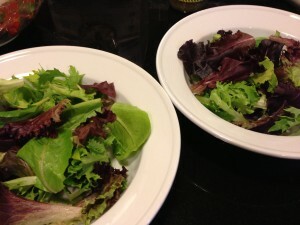 Then, I divided some fresh salad greens into two dinner-sized bowls. I shredded some Monterey Jack cheese. In another bowl, I tossed black beans, Trader Joe’s roasted corn (thawed), diced scallions, shredded carrots, chopped cilantro, diced red bell pepper, and sliced grape tomatoes with some canola oil and apple cider vinegar. I let that sit for a short while. Then, I spooned the bean mixture onto the center of the salad greens. The pulled smoked pork pieces were placed around the edges of the salad. 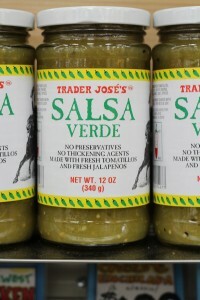 Trader Joe’s Salsa Verde and my Chipotle Cream dressing were drizzled onto the salads. 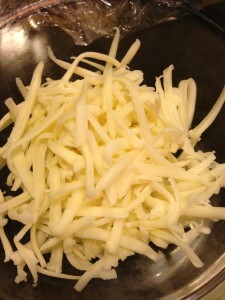 Shredded Monterey Jack cheese was divided between the salads. 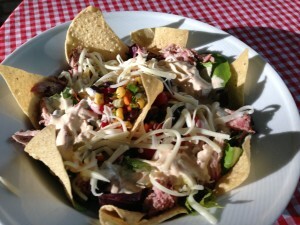 And, finally, a garnish of crispy tortilla chips crowned the Cowboy Smokehouse Salads! 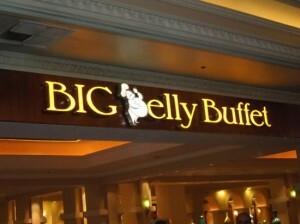 Ring the bell, it’s time for dinner! Accompany this salad with my Patriotic Berry Parfait for dessert! Mix all ingredients in a bowl. Whisk until combined. Chill until ready for use. 1. Shred smoked pork with two forks. Set aside. 2. 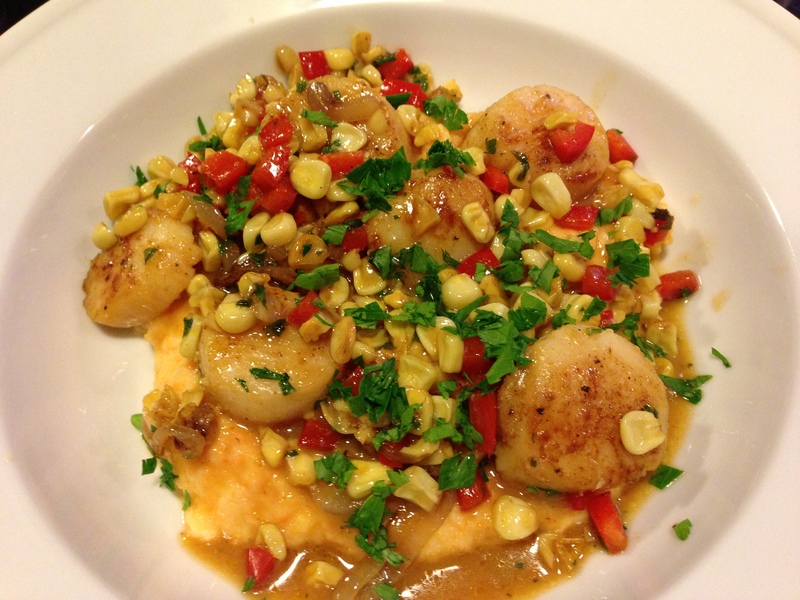 In a non-metallic bowl, combine black beans, corn, carrot, scallions, red bell pepper, tomatoes and cilantro. 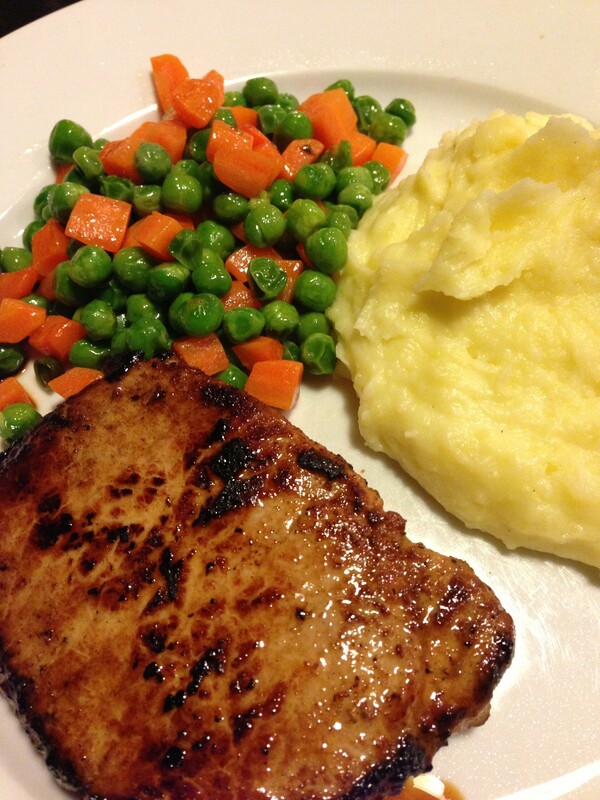 Drizzle with canola oil and apple cider vinegar and toss lightly. Set aside. 3. Divide salad greens between two serving plates/bowls. 4. Spoon bean mixture into center of salad greens. 5. Arrange pulled smoked pork around the edge of the salad greens. 6. 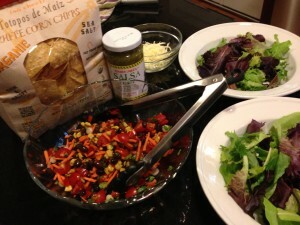 Drizzle the salads with the Trader Joe’s Salsa Verde and my Chipotle Cream dressing. 7. Divide the shredded Monterey Jack cheese between the salads. 8. 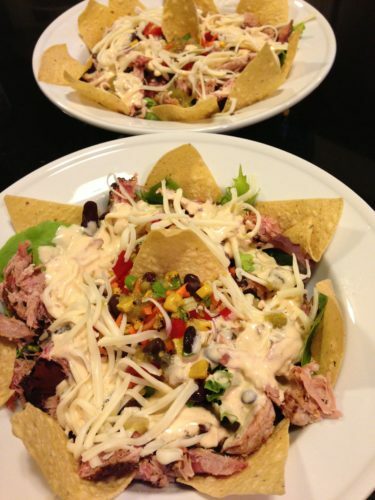 Garnish with the tortilla chips and serve. Serves 2 as an entree salad. 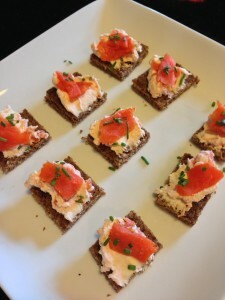 Serve with beer, sangria, or lemony iced tea. 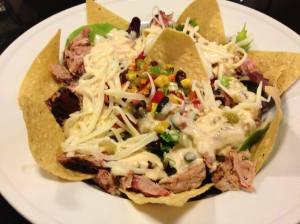 As an appetizer, try my Chile Con Queso dip or Fresh Tomato Salsa with tortilla chips. Variations: If you can’t find smoked pork, use regular pulled pork that you can purchase from your grocer’s refrigerated meat department. Substitute pulled smoked chicken for the pulled smoked pork. Use red salsa if you prefer. Add some sliced avocado or a scoop of homemade guacamole. Use a mexican cheese blend or Pepper Jack cheese instead of the Monterey Jack. 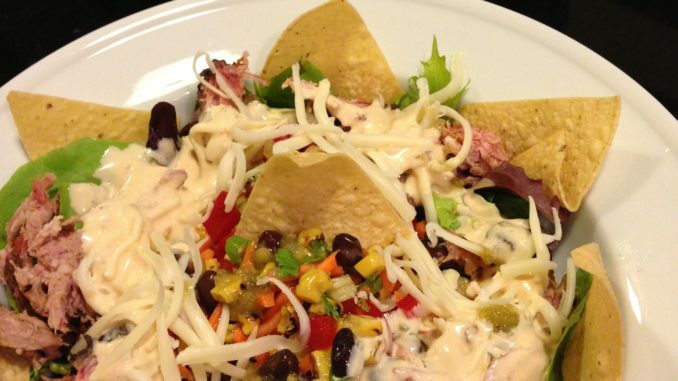 Omit the cheese and chipotle cream dressing if you are watching your fat intake. Even if you omit the pork, this salad is a very tasty salad on its own. For a party buffet, set out all ingredients in their own serving bowls, and allow your guests to assemble their own salads.